JLA #28, the first part of "Crisis Times Five" was a Grant Morrison JLA/JSA story that also (briefly) featured a few foes of the Pre-Crisis Supergirl. Ollie & Bruce: Crush or Competition? You decide. We know Ollie owes his Green Arrow persona to Bats, but do you know here was a time when Ollie didn't know that Bats was Bruce Wayne? Here from a JLA Giant from 1999 are 3 1/3 pages from a 10 page story that looks back at a time when Ollie got a little, let's say, obsessive with Bruce. So I broke down and bought "Marvel Divas". Maybe because the reviews weren't that bad. Or they had the groove-tastic 70's variant cover. Or maybe it was the two three margaritas I downed at the restaurant down the street during lunch. So I got to thinking. What if DC did a Divas/SATC type story? You know, have some of their lead women get together to discuss their love lives. All while doing some female bonding at a spa. Oh wait. They already did. 3 and 1/3 pages from a 10 page story from JLA Giant number 2. I'm in the process of dredging up a couple old recommendations of mine. First on the list is JLA: The Obsidian Age. 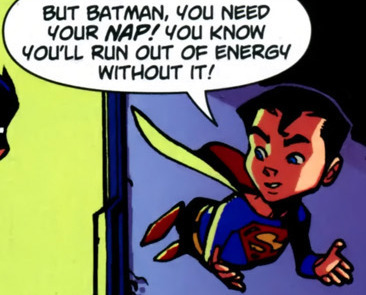 This was the crowning point of Joe Kelly and Doug Mahnke's run on JLA, a few years before Infinite Crisis. A mega-arc so big it took two trades to complete, this story could have been even better than it was. A little more refinement, a little more thought during the writing process, and Kelly would have crafted a masterpiece. *sigh* Ah, well. Even the flawed version that we got was tons of fun. Runespoor7 requested interaction between Batman and children. This post I've scanned 4 pages from JLA #106, "The Pain of the Gods," Nov. 2004, 22 pages. I don't have #105 so I can't summarize this very well, but I'll try; feel free to fill in the gaps in the comments, gang. The issue opens with Superman and Wonder Woman stopping a super-powered boy from beating the krep out of a gang of schoolyard bullies. The kid is furious with Superman for "letting his father die," and punches Supes clear through three rooms of the school building. So, next step: Talk with his mom.